Take Chewbacca and Furby -- mash them together and, obviously, you get "Furbacca." 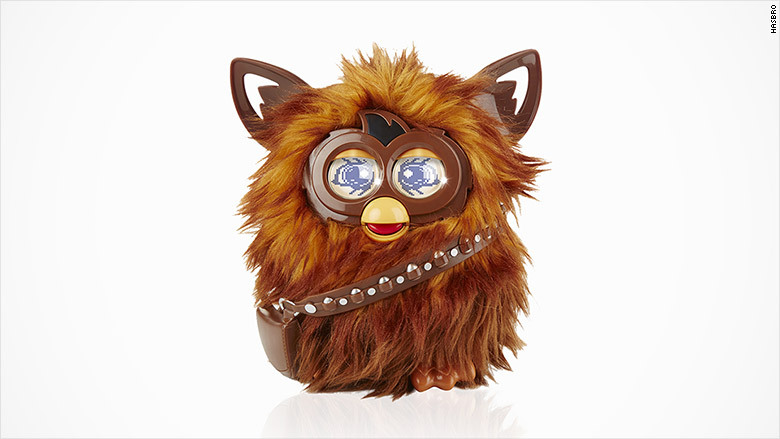 Furbacca from Hasbro hums the Star Wars theme songs and plays virtual games. Using an app, he also makes Wookie sounds. The free app lets kids join Furbacca (priced at $79.99) in a Star Wars-themed world where they can explore the galaxy and collect virtual Furby Furblings (baby Furbys, in case you were wondering). "As far as we know, this is the first-ever movie-character-based Furby," said toy industry expert Jim Silver. "It reminds me of a Darth Vader-themed Mr. Potato head from Hasbro a few years ago. It was hugely successful and sold out."